Shocking conditions welcomed the U8A side at Brambletye after the rain had been pouring down all day. The pitches were quite a state but this didn’t stop the boys putting in a much improved performance after last week. The game began very well for Copthorne. The ever elusive William wriggled free from a few attempted tags to score and this was quickly followed up by some excellent tagging and a breakaway try by Ollie to put the boys two tries up early on. In difficult running conditions the boys were coping remarkably well and the passing was much improved. Brambletye eventually pulled a score back but it was Copthorne who kept the pressure on with well worked tries from James and Dylan before, once again Brambletye pulled a score back. William went on to score another excellent try, running from nearly inside his own half but it was Brambletye who finished the half the stronger as they scored a couple of tries to pull the score back to within one of Copthorne. 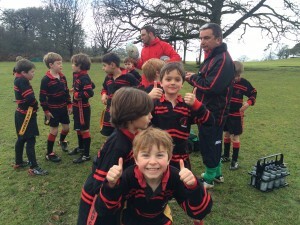 A half time team talk where the boys mostly could not believe how muddy they were ensued. Perhaps the wet and cold was starting to take effect as it was Brambletye who started the stronger of the two sides. Rafe kept us in it with some outstanding diving tagging and he was well backed up from Josh and Pranav. Finally the boys got themselves into gear and started to run hard and straight with the ball. James nipped in down the touch line when it looked easier to go out than to score and William and Dylan both got on the score sheet once again.